These ideas come from Sunay Palsole, PhD, associate vice provost for digital learning at the University of Texas at San Antonio. 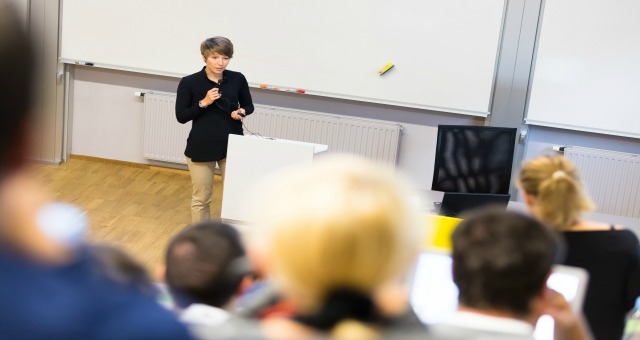 In a recent presentation for the annual Online Learning Consortium Blended Learning Conference, he discussed several ways to build institutional support for blended learning by working with various campus offices. He shared four such ideas with us. Any blended learning effort will require the enthusiastic support of the faculty because they will be the ones offering courses in this new (for some) delivery modality. Palsole notes that many faculty members will implicitly or explicitly ask, “What’s in it for me?” “They always need to have some kind of motivation,” he says. Luckily, faculty are typically “very candid” about explaining their concerns and motivations, Palsole says. The challenge for them, typically, is “managing to fit [blended learning] into a busy schedule.” Faculty members are likely to be concerned that their efforts are properly recognized: that they are receiving the money, extra time, or credit toward promotion and tenure that they deserve. Although some may argue that faculty members should be intrinsically motivated to develop and deliver blended courses, the reality is that most people need some form of extrinsic motivation. This often takes the form of compensation for the extra demands a blended course might require, such as extra time for development, extra time for delivery, impact on time the faculty member can spend on other components of their job (such as research, publication, and service), and impact on the faculty member’s assessment as an instructor. It’s important, Palsole says, for faculty members to be fairly compensated. Here, Palsole says, one must understand the culture and rules of the university itself. At some institutions, it is easy to compensate faculty members, because policy and culture allow for supplemental pay for additional activities, including developing and delivering blended courses. The challenge, then, becomes finding a source of funding. On other campuses, however, additional monetary compensation is not permitted. Then, the administration needs to think of ways to help encourage faculty. “Some chairs come up with creative ways” to provide additional compensation, Palsole says. These might include things like release time or service credit (credit toward promotion and tenure for service to the university) for time spent on developing a course. Of course, it isn’t just the faculty who need to be considered when making a move to blended learning. Other on-campus offices are also stakeholders; one of these is scheduling. Many universities are considering moving some classes to a blended learning modality to maximize the use of space on campus. “There’s no money to put up more buildings,” says Palsole. So, it makes sense to minimize the number of face-to-face meetings while maintaining the quality of the education. For example, whereas once only a single course could meet 10:00–10:50 MWF, now three sections of that class can meet all using the same physical campus room; one section can hold its face-to-face meeting on Monday and accomplish the remainder of the class online, whereas another section can meet on Wednesday, and a third on Friday. The challenge, of course, comes at exam time. An exam schedule that only takes into account the scheduled time of the class (like 10:00 MWF) could wind up with all three sections trying to take an exam in the same room or in double-booking students who were also maximizing their time by taking multiple blended classes in the same time slot. Faculty must work with scheduling to be sure that the students are able to approach their exams with the concentration they need. Blended learning, Palsole says, may be a good first step for faculty who are not comfortable with online learning. Perhaps surprisingly, research consistently shows that some faculty members remain concerned about the academic value of blended and online learning, and helping students learn how to learn remains a major incentive for faculty. Palsole suggests that the power of the Institutional Research Office be tapped to help faculty understand the value of blended learning. Institutional research is “a very important resource that everyone needs to know,” he says. The professionals in this office can help ascertain the efficacy of blended learning on a specific campus and assist faculty in understanding the impact of their choice to participate. Data generated may include successes gained by faculty, students, the institution, and the program, as well as cost savings generated by the efficient use of space and resources. Of course, research and scheduling are not the only offices that need to participate to make blended learning a success. Palsole explains that the provost, the Office of Business Affairs, and the VP of student affairs all must lend their support to the blended learning initiative. For example, the provost can provide funding and academic support while also lending leadership to deans and department chairs, who will support their faculty members and help to explore new incentives for attempting blended learning. The Office of Business Affairs can be critical in helping understand the costs of using the physical infrastructure of the campus. Finally, the students need to understand and buy in to the benefits of blended learning. Blended learning can help to address common student concerns, like the availability of parking, scheduling flexibility, and ability to get the courses they need. The institution needs to communicate the ways in which blended learning helps address these concerns and make students comfortable with their likelihood of success. For example, Palsole mentions campuses that provide short courses on how to be an effective online learner to boost students’ confidence. Other institutions undertake educational or public relations campaigns that point out the benefits of taking a blended course, such as the decrease in number of days the student has to drive to campus and find a place to park. For some students, this decrease in hassle may offset any additional fees required to support blended learning courses. Reprinted from Distance Education Report, 19.19 (2015): 1, 2. © Magna Publications. All rights reserved.